A little known odd fact about the history of Old Glory, is her sister, the forgotten Civil Flag of the United States. The first authorization of a U.S. flag came about on June 14th, 1777, when Congress directed that a U.S. flag consist of 13 stripes, alternating red and white; that a union be 13 stars, white in a blue field, representing a new Constellation. Through usage, horizontal stripes were adopted for use over military posts and vertical stripes adopted for use over civilian posts. Most flag purchase orders were for the military version by the Federal government. Out paced by military purchases, civil flag orders were almost non-existent as the cost was far more than most Americans could afford. Sightings of the Civilian Flag were rarely seen until U.S. Customs adopted the Civil Flag in it's enforcement of tax collection and inspection in ports as opposed to acts of war against merchant ships. In 1790, Alexander Hamilton proposed armed shipping vessels to enforce customs duties in the nations shipping ports. Congress agreed and appropriated $10,000 to maintain 10 revenue cutters (ships) to be placed under the charge of customs collectors. On March 2, 1799, Congress revised the duties of revenue cutters and added authority to fire upon other vessels if such vessels did not respond to a cutter's flag and a gun shot warning. 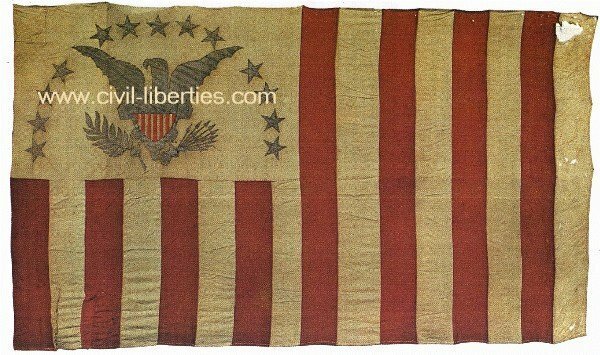 On June 1, 1799, Oliver Wolcott, Hamilton's successor, submitted his flag design to President John Adams. His proposal defined the new Customs Flag with 16 stripes, one stripe for each State that had joined the Union by 1799 and turned the stripes vertical to show the civil nature of it's use as opposed to a military nature. For the Union, Wolcott proposed using the Arms of the United States, the American Bald Eagle, over a white field. The final version was approved on August 1st, 1799. Although intended just for the Customs Office, the new civilian flag became adopted by customhouses and merchants to show their civilian nature as opposed to being under military control. The practice of using the Customs Flag as a Civil Flag became encoded in law in 1874 when Treasury Secretary William. A. Richardson required all customhouses to fly the Civil Flag. In 1915, the U.S. Coast Guard became an independent bureau from the Treasury Department, absorbing the Revenue Cutter Service. The Civil Flag used by the cutter service was modified and adopted under Coast Guard authority, losing it's original significance of civilian authority, which by then, had been long forgotten as the Federal government acquired more control over the States and their citizens. 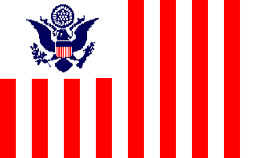 By 1951, the original Customs Civil Flag had been phased out completely with another redesign. It is believed by some historians that the Civil Flag was discontinued after the Civil War when the federal government imposed military governments in the States and disbanded civilian government. As a show of it's power over the States, Civil Flags were discontinued and Old Glory became the sole emblem representing the People of the United States of America, united under military (or admiralty) rule. For over 100 years, the Civilian U.S. Flag was flown by a select citizenry that could afford to buy them. While most were of the design of the Customs Bureau and it's American Eagle, many continued to adorn the original look from 1777 with a constellation of stars on a blue field and with red and white vertical stripes. By 1900, the Civil Flag had all but disappeared except for the occasional use by the government's revenue cutters and more recently, the Coast Guard with a modified design. By 1980, nearly all documentation of the Civil Flag had been omitted in school text books and it's existence left as a mystery in a few old photographs and a rare mention in classic books.